When visiting Hong Kong, you’ve gotta eat at cha chaan tengs as often as you can! We had breakfast at Fortune City One, a mall in Sha Tin. Yep, we came back for a second day in a row! At this restaurant, orders are placed at the front counter and picked up at the window when your number is called. The dining area is self-seating and usually packed with several shared tables. My friend had the above breakfast set. 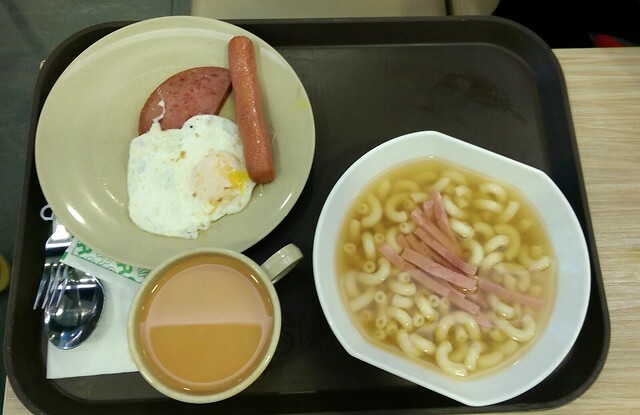 Macaroni or shell soup is very popular in Hong Kong. She chose eggs with sausage and luncheon meat as her sides. I had the above breakfast set. The standard type of noodle in noodle soups at cha chaan tengs is instant noodle, but you can have rice noodles (vermicelli) as a healthier option. On the side, I had eggs with ham and luncheon meat. Verdict: I preferred Eight and One‘s satay beef noodle soup. (Eight and One was the only other place I had satay beef noodle soup while in HK. If you have a favorite cha chaan teng for satay beef noodle soup, please do tell!). I also preferred Tsui Wah’s stocking milk tea over Super Fast Food; Tsui Wah’s is bolder and stronger. 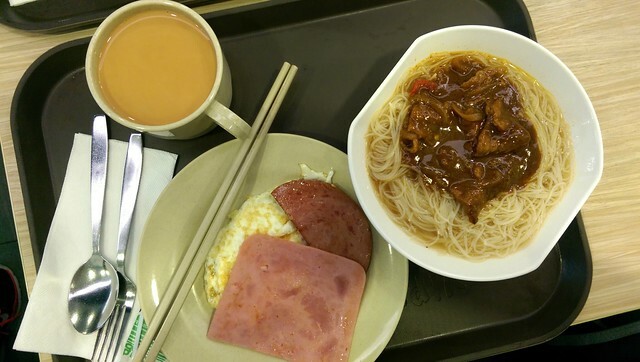 Overall, Super Fast Food is convenient and affordable for folks in the area to get a cha chaan teng style meal before heading out.